Goodness ever since I wrote about cravings I've been struck by food thoughts. Yesterday Jill came over and brought two packages of this cake/cookie called 'zebra cakes' that she'd received in a package from America. I'd never heard of nor tasted it but she raved about them so I was eager to take a bite out of American consumerism. And you know what? They didn't taste good to me. Why? Because they were too sweet! I couldn't believe it. I haven't had packaged sweets for months now and so this artificial round cake topped and filled with icing didn't appeal to me whatsoever. I've had so so many Serbian baked goods, chocolates, pastries, and also desserts from neighboring countries like Turkish baklava and Bosnian tufahije (poached apples). It's hard to tell what's Serbian and what's been influenced by other countries in Eastern Europe since it was once all Yugoslavia but basically all slatkise (sweets) I've had here vary significantly to those offered in the states. My absolute favorites are the domaci sitni kolaci (literally mini domestic cakes). 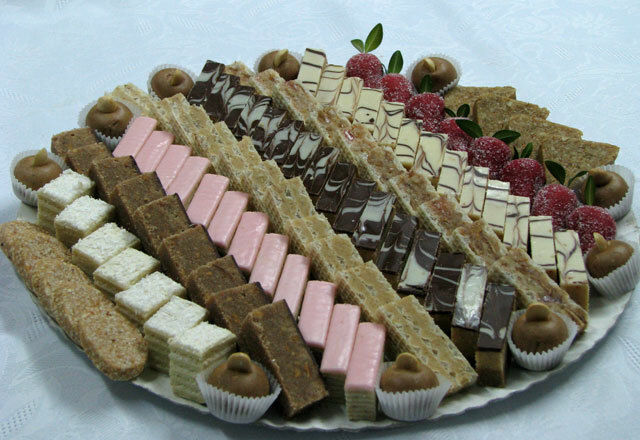 They are laid out on platters at all celebrations and are an assortment of walnut, hazelnut, almond, dark-milk-white chocolate, vanilla, fruit, coconut, wafer, cream concoctions. As you can see these are absolutely mouth-watering and my friends and I always wind up huddling around these trays and sampling each one. My favorites are called bajadera. They're the dark brown one with white swirls in the middle. The bottom layer is chocolate, the middle an almond-hazelnut, and the top is a thin layer of hard chocolate. So so so ono (hawaiian word for delicious)! The point of all this was to show you that it's not as if I'm withdrawn from sugar, but rather it's not processed and wrapped in plastic. The difference between the zebra cake I ate and the lovely sitni kolaci is astounding and I think it will take me some time to get used to living with America's food production. Also I didn't mention this in the first of these three posts about food but toasters and microwaves are basically foreign to the Balkans. The kitchens I've seen are equipped with ovens, stoves and sinks but no convenient methods for reheating or toasting. My teacher in Novi Sad was shocked that we used microwaves because she swears they're bad for your health. Are they? I remember being told not to stare into the microwave which is exactly what you want to do when your waiting but I don't remember them bearing diseases. They also don't have toaster ovens which is why I said I miss toast. What I wouldn't give for a toasted strawberry or cinnamon-raisin bagel and some peanut butter or cream cheese. What a classic American thing to say. I always would see that as a common breakfast in tv shows and movies and I didn't think anything of it but I remember my host family in Novi Sad asked me what some character was eating in an episode of Friends and after explaining the bagel/cream cheese concept to them I asked what they thought it was and they said a sliced krofna (similar to a donut) with pavlaka (sour cream)! That was a funny culture collision. Another jumbled post, I apologize. Overall I intended to express minor disdain for America's processed foods and some other slightly-related thoughts came into my mind while writing and I never like to stifle thoughts so I included them. Your post is so sweet! ;) I am so happy you are there and documenting all these wonderful moments. What a great experience for you. A couple days ago I got a call from Punahou's Service Learning Center. They are getting ready to do the annual book drive and want me to come to this week's chapel services to share a little bit about where the books end up. Shortly after I introduce myself, I will share with the students your video! Chaplain George Scott was thrilled and amazed to see it. He told me to tell you hello and that he remembers you were a special, thoughtful student with much depth. I couldn't agree more. I will let you know how it goes.